Great story and interesting that the rosé worked well in the cold weather. Were you nibbling something along with it? On the Cahors, how would you distinguish it from an Argentine Malbec? The Rosé was great with my snails and also with the chicken, but even before the food came the Rosé was just right. As for Cahors, it comes in two basic guises–one is a long-term wine that is grown on a limestone mesa, the other is a softer, more youthfully accessible wine from grapes grown on the sandy slope between the mesa and the Lot River. Either way, Cahors is generally is just as fruity as a typical Argentine Malbec, but it has an overlay of stiffness (mostly an expression of tannin), so it seems WAY less generous with its fruit, and can even feel unpolished. This changes when you add food to the mix, as the tannin becomes incredibly useful with pairing options. 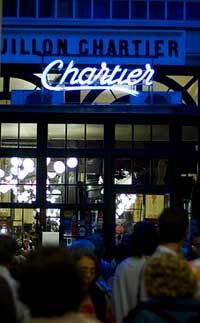 The first time I went to Paris, at the holidays in ‘07, a girlfriend of mine, who lives in LA, happened to be there at the same time, and said that Chartier was her favorite restaurant in Paris. A lot of others’ too, considering the lines! 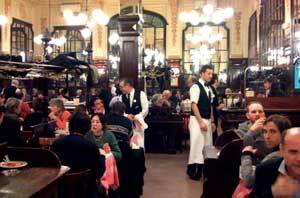 I’ll be honest– I wasn’t terribly impressed with the food, but I loved the surroundings. So, I have to ask, Burke, though this is a wine blog– what did you think of the food? I agree with you–the food’s not the reason to go…it’s not impressive or fashionably executed, but it does overachieve price-wise–for five of us with two bottles of wine and three courses, we paid €110 (about $30 per person, and with the exchange rate that’s a steal). While my lamb chops were a little overcooked, the steak, chicken, and choucroute were solid, and the desserts were good. So that’s a real testimony to the experience. As you’ve said in other places, it’s the people and reason for being there that makes the wine (and food) memorable. Noir de Castyrac is produced by Jean Luc Baldès of Clos Triguedina (www.jlbaldes.com). You are right in the fact that this particular label is exclusive to France. However, many other wines by Jean-Luc Baldès and Clos Triguedina are available in the US and are just as delicious. We are delighted you enjoyed our wines. Thank you! We would like to extend a welcome to you and anyone else who would like to come and visit the estate, discover the region, and of course our wines. Si vous êtes lotois ou juste “sympathisant” de notre région laissez moi un message sur mon blog : http://www.leslotoisdeparis.blogspot.com.